Marcia, Marcia, Marcia! If Moonshine County Express is remembered at all today, it is as one of the few big screen releases to feature Brady Bunch girl Maureen McCormick in a supporting role. That’s unfortunate; because McCormick’s vapid performance is the least interesting element in one of the more enjoyable entries in the 1970’s moonshine movie genre. The film is a David versus Goliath story, with whiskey taking the place of the slingshot. When Pap Hammer, a minor league moonshiner, is murdered by his rich, well-connected rival, Jack Starkey (William Conrad), the small-timer’s daughters (Susan Howard, Claudia Jennings, and McCormick) are pressured to leave the county. The Hammer girls decide instead to stand up to Starkey, and they find just the right weapon in their pap’s secret stash of 90-proof, Prohibition-era, bonded whiskey. The girls undercut Starkey’s whiskey prices with the local merchants and provide higher quality booze to boot, so the big man’s business quickly dries up. When Starkey starts feelin’ the squeeze, he plans to slaughter the Hammer girls and steal their stash of primo whiskey. However, what Starkey doesn’t know is that his best driver (John Saxon) has switched sides and is in bed (figuratively and literally) with the girls. 1) The Script – While most of the 70's drive-in moonshine movies were merely variations on the insanely successful Thunder Road (1958), in which a speed demon drives circles around the feds and rival bootleggers, Moonshine County Express, focused instead on a trio of wronged women who take matters into their own hands. While John Saxon receives top billing as the typical lead-footed moonrunner, his character is secondary and weak-willed in relation to the ladies. The story is a welcome change to a stale formula. 2) The Cast – With the exception of the remarkably uncharismatic McCormick, the actors are far better than the material. The leads, Susan Howard and John Saxon, are never believable as hillbillies, but they give stronger performances than you usually find in a drive-in flick. However, the real fun is in watching A-list character actors, such as William Conrad, Dub Taylor, and Jeff Corey having a great time hamming it up. 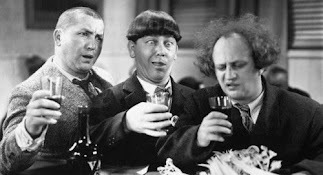 3) The Booze – Moonshine movies are generally about driving booze rather than drinking it, but this is one film where the bootleggers actually enjoy their own product. While it would be going too far to say that this movie was soaked in corn liquor, it does at least get a little damp. In short, Moonshine County Express is junk, but it is enjoyable junk. It may not go down as smoothly as prime, aged whiskey, but it ain’t rotgut either. BETTY: Alright. That do it to ya? DOT: Oh, that’s nice. That’s nice. (She passes the jar to Sissy) Have some. SISSY: Mmmm. He sure did make good ‘shine. DOT: ‘Shine? Honey, that ain’t 'shine. That’s real Prohibition bootleg. 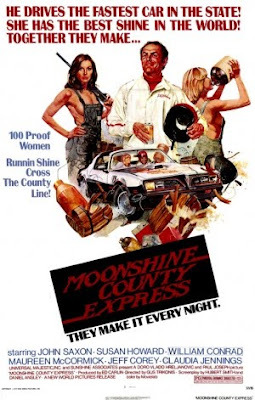 Video Availability--Moonshine County Express was released long ago on VHS, but it has never officially been released on disc. However, Yammering Magpie Cinema has a full frame collector’s copy available on DVD. The video quality is on par with VHS, but you may have no other opportunity to check out this rarity. The DVD can be purchased on Yammering Magpie’s Website HERE. Similarly Sauced Cinema--Maureen McCormick starred in another drunken hillbilly drive-in flick, the unwatchable Texas Lightning (1981), directed by Gary Graver (the cinematographer of Moonshine County Express).